Metro Guard offers one of the best roach treatments in the industry. An experienced licensed professional arrives on time. After a thorough inspection, he will discuss what kind of roach you have and what the exact cost will be to eliminate the problem. He will discuss the warranty that all our roach services include. He will proceed with the service if you select our company. There will be no need to set an additional appointment or worry about who might come out to do the work. 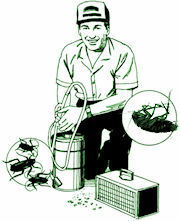 Our technician uses an advanced professional baiting system for certain types of roaches. Other types of roaches may require an exterior treatment for elimination and prevention of future problems. Our technician will take the time to explain your warranty. Our technician will give you any other information you need. Our services are effective and fast. Our warranty is there in the unlikely event your problem is not completely solved. With our large service team you will not have to wait for a convenient service day. Our customer service group is ready for your questions or warranty requests from 7am to 9pm M-F or 7am – 4pm Saturday. Our broad range of services means you have a company you can count on no matter what pest problem you have. We appreciate your business and will treat you as a valued customer.